The term "vocal acrobatics" pops into my mind when I hear the song The Tina-Lina. Written by Brodszky and Cahn for Mario Lanza’s film The Toast of New Orleans, its sole purpose is to provide an opportunity for a big dance production. These extravagant productions were typical fare in MGM’s 1950s musicals. However, it is the only one found in a Lanza film. His vocal talent was what his audiences craved, and I believe dancing was one of the few areas in which he never would have excelled! But what a toe-tapper this lively tune is! It might also have been devised as a vehicle for showing off Mario’s amazing breath control and excellent diction. What I’ve come to realize is just how many words are crammed into each line of music. Mario has to practically do flips and cartwheels to get all the lyrics sung. Hear it in the lines “You’ll know why when you have seen her dance like no one ever danced before” and “Once you’ve danced with Tina-Lina, there’s no other ballerina who will dance you right to Heaven’s door. And before the dance is ended, you’ll achieve what you intended, and she’ll care for you forevermore”. “All it takes is wind and passion” sums it up quite nicely, I think! This is, indeed, not a song for a singer of lesser ability. I’m sure it is a very exhausting effort! After listening to all three versions of this song (Coca Cola, commercial and soundtrack), I’ve come to appreciate how superior the commercial one is. The film recording seems (to me) to be delivered in a faster tempo. I imagine that is because there is actual dancing taking place. Mario sings the commercial one a bit slower and I hear a warmer, rounder presentation. But, no matter what the tempo, this song is difficult to sing! Listen to how he slows to sustain the last words in these phrases: “…..prepare to lose your heart”, “….it’s the fun way to caress”, and “….the Tina-Lina, because you’ll never be the same”. 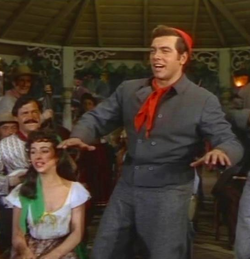 Lanza singing the "Tina-Lina" in The Toast of New Orleans (1950). Rita Moreno (playing Tina) is seated on his right. He sings them skillfully, filling them with an abundance of exciting sensations. I suppose more care and attention was given to recording the commercial version. Mario seems to be in full command in it, when in the film, he is more of an accessory to the dancing going on around him. In fact, at times, as I watch the film, Mario seems to be jockeying his position to stay in the picture! hat is clear, strong, uninhibited and breathtaking! Further to my initial thought, I feel that the song was conceived with a visual effect in mind rather than attention to a particular melodic line. It does have a melody, but we don’t focus on it much. Attention is drawn mainly to the activity involved. Yes, it is thrilling in the film to hear him break loose with that song-ending, sustained “Aa-aaa-aaa-aaa-aah”, but listen to the same vocalization at the end of the commercial recording and there is no comparison! He ends the latter with a brilliance that is clear, strong, uninhibited and breathtaking! Such a rousing sound simply stuns the senses! He also covers it perfectly while in the other two, we hear a sound that is more open and indelicate. The Coca Cola version is my least favorite of the three. He dedicated it on his radio show to his sick little friend, Raphaella Fasano. However, he does sing it with a definite smile in his voice that I’m sure was meant to be his get-well message to her. I hope this has been a “get-happy” message to all of you!